If the view is poor (CL grade 3 or 4), the laryngoscope can be used to guide the tip of the ETT and endoscope “into the ballpark”, and then the final positioning of the tip of the tube through the vocal cords is achieved with the endoscope. Another dual endoscopy approach is “VAFI” (video-assisted flexible/fibreoptic intubation), where a VL is used to help place a flexible endoscope, whereafter the rest of the intubation is continued using the flexible. Several good case reports of this technique are described in the literature. Here’s a brief clinical example of dual endoscopy using the CMAC VL and VS (video stylet). This case was performed for teaching purposes, rather than a difficult airway. Note the endoscopic view appearing as a picture-in-picture is from the editing; the images are on two separate displays. (It starts a little late due to the author forgetting to press the record button on the device). Intubation in a young child with a severe submandibular abscess using the paediatric Bonfils rigid intubating endoscope under inhalational general anaesthesia. Direct laryngoscopy showed only severe swelling with a Cormack-Lehane grade 3b view. 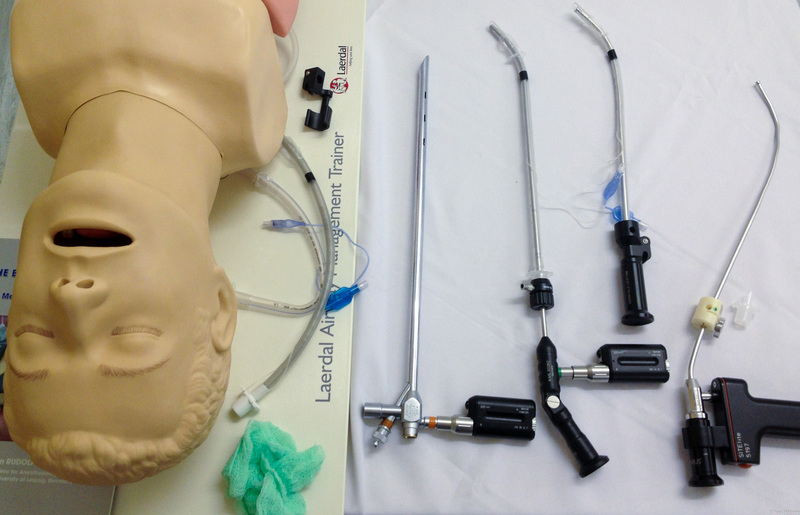 A standard laryngoscope was used with the left hand to create an open path for the Bonfils just right of the midline, avoiding the worst of the submandibular swelling. 3.5mm Bonfils allowed intubation with a 4.5 mm uncuffed ETT. Note that because this is a rigid intubating scope, it is not inserted through the vocal cords, but they are visible through the tube as it is inserted with the Bonfils held steady.